A light Breakfast and then off to an early Dermatologist appointment. My yearly checkup, nothing new and everything looked good! From there I took Mom to Kroger and stopped by the bank for her. Back home did a few things around the house and then did some cleaning outside. Had the cart for a while after getting everything done. Another gorgeous day, and it’s the first day of Fall! Fall is my favorite season. 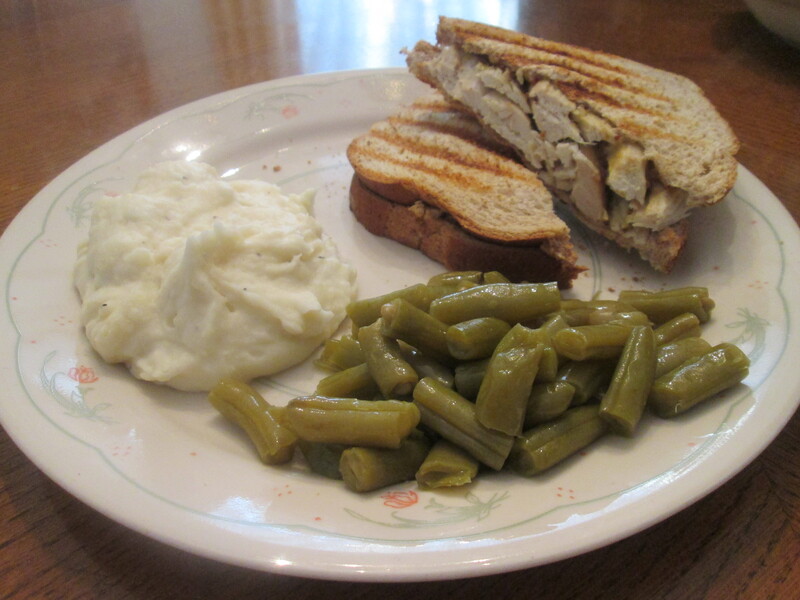 For dinner tonight it’s all leftovers, Roasted Chicken Panini w/ Mash Potatoes and Green Beans. Love those Leftovers!That’s my dinner tonight, leftovers from last night’s dinner. I used the PERDUE® OVEN READY Whole Seasoned Roaster Bone-In Breast, Bob Evans Mashed Potatoes, and the Canned Green Beans. Everything was so good last night I wasn’t going to let the leftovers go to waste. I made the leftover Chicken into a Panini Chicken Sandwich. For the bread I used Klosterman Wheat Bread and Private Selection Sweet Hot Stone Ground Mustard for seasoning. I got my Panini Grill out, been a while since I’ve used it. Sprayed the the Press with a light coat of Pam Cooking Spray and plugged it up to heat it up. I used 2 slices of the Bread and put a light layer of the Stone Ground Mustard on the bottom slice. Layered the Chicken on top of that. Then added more of the Mustard on the top half slice. I then put the sandwich into the Press and let it heat up for about 4 minutes. This is one good Sandwich! The Panini Press grilled it perfectly. The Chicken was delicious as it was last night and the Sweet Hot Stone Ground Mustard was perfect on the Chicken. 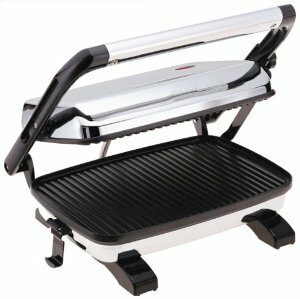 A panini press or grill is a type of contact grill designed specifically for heating sandwiches, meat products, vegetables, or specialty menu items. Almost exclusively powered by electric elements, it comprises a heated bottom plate that is fixed, with a heated top plate that closes on, and comes in contact with the food. The function of the Panini grill is to heat food to an appropriate internal temperature with desirable external characteristics (i.e. food safe, melted cheese, crisp finish, grill marks). Designed for countertop use, these appliances meet the operational need for fast, consistent production of a la carte or small batch cooked products. Commercial Panini grills are a system of three main characteristics: Platen Geometry and Material Electrical Power, and Hinge Mechanism and Contact. The various combinations of these individual aspects affect the performance of the grill. Performance is defined by such aspects as cooking time, finish of the cooked product, ease of operation & maintenance, and durability. Lunch Time with a Panini Sandwich! An easy made and healthy lunch. 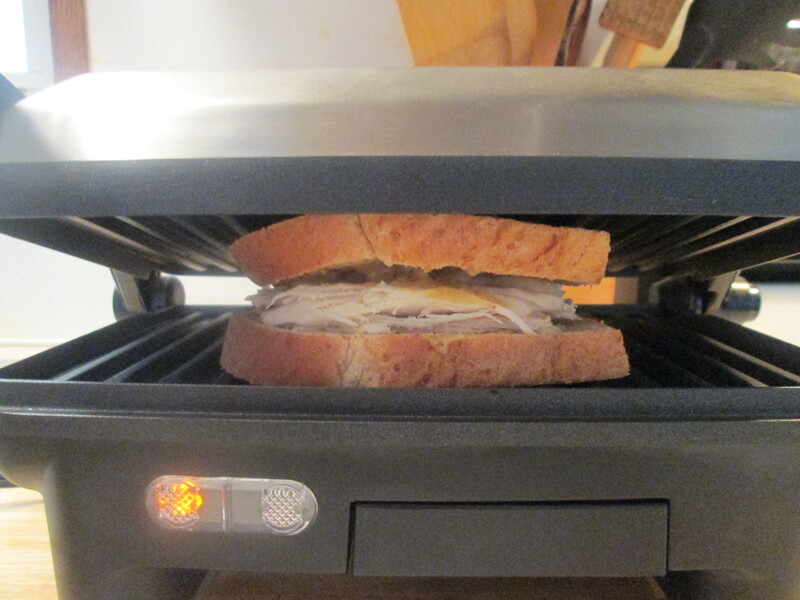 Heated up my Panini Grill and made a Ham & Turkey and Swiss Panini. 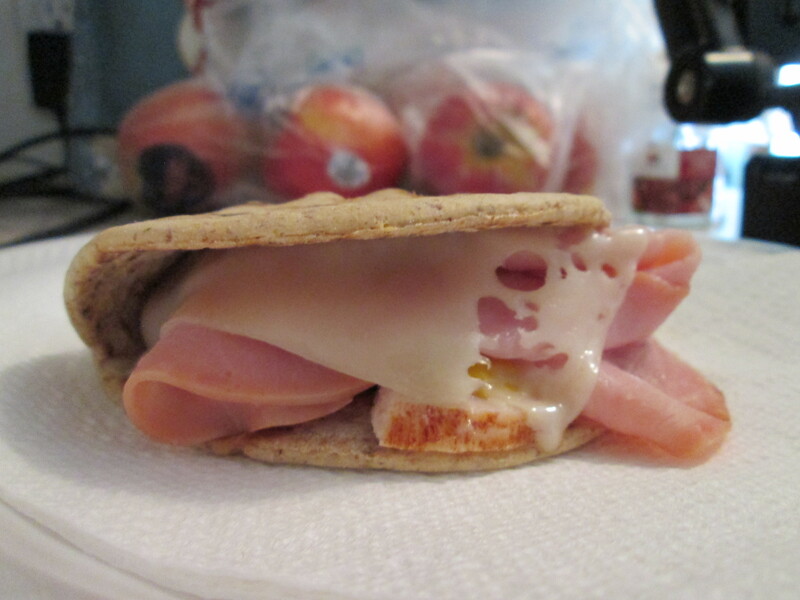 I used a half serving Oscar Mayer Carver Board Sliced Turkey Breast, a full serving of thin sliced Ham, a slice of Sargento Ultra Thin Swiss Cheese, and a Flatout Whole Wheat Flatbread. I also added French’s Mustard to top it. All for under 250 calories and made in about 15 minutes! Light and Easy dinner tonight! I fixed a Chicken Panini topped with a slice of Monterey/Jack Cheese and Reduced Mayo w/ Olive Oil. For the Chicken I used Walmart Rotisserie Chicken and Healthy Life Whole Grain for my Bread. As a side I had a half of serving of Salt and Pepper Pop Chips. For dessert later Walmart Bakery Sugar Free Angel Food Cake topped with Del Monte Sugarless Peaches. Putting that Panini Grill to use! Had a Panini Grilled Ham and Swiss Sandwich. I used Healthy Life Whole Grain Sliced Bread, Oscar Mayer Carver Board Ham, 2% Swiss Cheese, and some Kraft Mayo w/ Olive Oil for the sandwich. The Beans we re Joan of Arc Spicy Chili Beans and to those added Jack Daniels Smoked BBQ Sauce, crumbled Turkey Bacon, and a few splashes of frank’s Red Hot to liven it all up a bit! Washed it all down with an ice – cold Diet Dr. Pepper that had I put in the freezer to get that slushy layer! 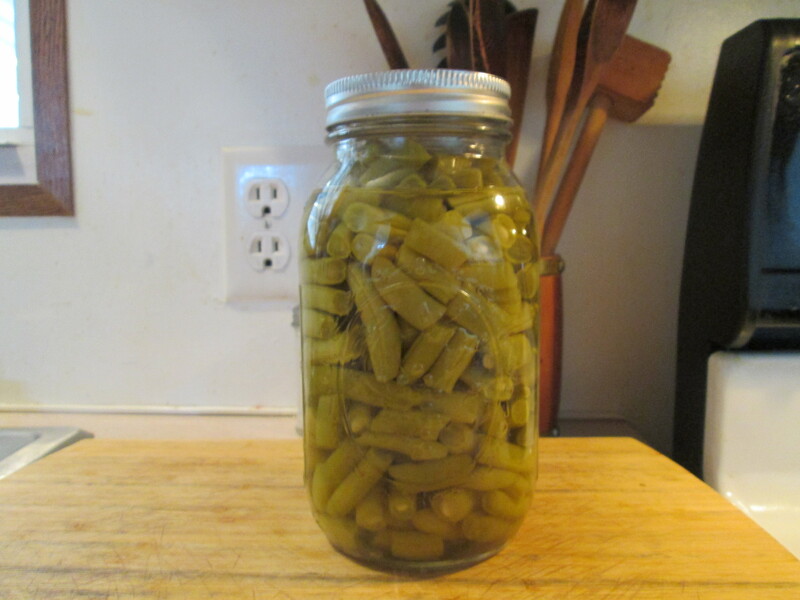 If you have read my posts for a while you may have noticed I have almost switched over completly from Aunt Millie’s Whole Grain products to Healthy Life Whole Grain products. The reason being Healthy Life is a little lower in calories and carbs and also somewhat lower in price, plus the taste and freshness on all their products are very good. Well while at my local Meijer earlier today I purchased my first Panini Maker Grill. I had been wanting one for a while and they just happened to have them on sale. It’s a Bella Cucina Artful Food Brand and can be laid flat to be used as a grill also. Tried it out for dinner earlier and made a Turkey and Swiss Panini. So I can finally add Panini Sandwiches to the dinner menus for home. I think the next kitchen toy will be a juicer, I’ll keep you updated! Put the new Panini Grill into use right away! First time I ever owned one and love it. This will expand the menu choices. 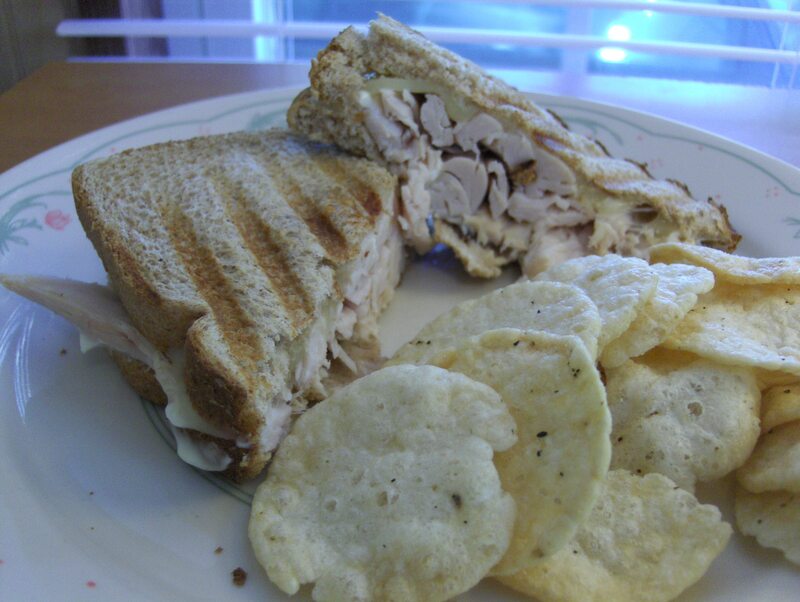 My first one I fixed on the grill was a sliced Turkey Breast with 2% Swiss Cheese on Healthy Life Whole Grain Bread. I purchased another Jennie – O Turkey Breast and had baked it earlier and then sliced it all up for sandwiches throughout the week. As sides had some Green Beans leftover from last night and 2 Potato Pancakes leftover from my Mom’s dinner she had fixed yesterday. Not sure on dessert or a small snack for later.